After people visit plenty of places they look for something which would give them their money’s worth, something different for them to realize and experience the beauty of nature and to get more closer to what they have never experienced before. An experience that would be unforgettable to watch the entire surrounding at a glance from a comfortable location with your chilled beer or champagneon the rooftop bars. Drinking is fun, but drinking outside on a rooftop bars is something different. Imagine some lovely cocktails and beers while soaking in some of the best sights from around the world, right from Mumbai to London and from New York to Hong Kong. Like brunching, drinking on a rooftop bars is something of a sport in New York. As warm weather rolls in, the Gothamites gear up for all manner of seasonal activities, including outdoor dining and enjoying cocktails with a view at the city’s best rooftop bars. 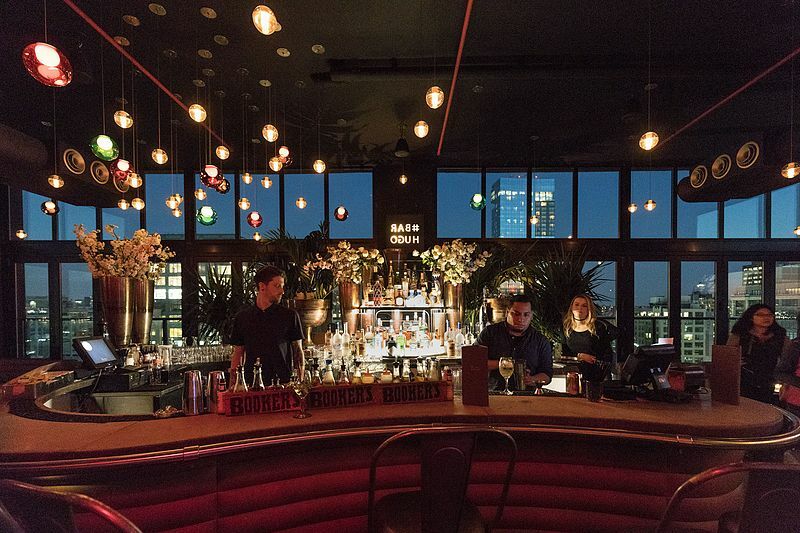 Here are some best rooftop bars in New York. From the outdoor terrace bar of the Wythe Hotel’s sixth floor, view of the East River and Manhattan, and its ideal vintage point for watching summer sunsets is amazing. It also offers an incredible view of Brooklyn and Williamsburg and Manhattan at the end. If you are visiting at night you have to show your ID before getting in the bar. No minors under 21 are allowed. During weekends you can come along with your family without any problem. Berry Park rooftop barS have phenomenal view of the city, an industrial interior and an affordable boozy brunch menu and soccer games showing on the weekends. The feeling of being on a terrace is great because it makes you forget you are in one of the most populated cities in the world. There are tables all over the roof, no loud music, giving it the vibe of a hangout location more than a party bar. The view from the rooftop bar is absolutely amazing. Williamsburg’s William Vale hotel offers a seriously impressive view of the Manhattan skyline and the experience will only leave a deeper impression once you’ve polished off you’re kind of kick. (Scotch, thyme, lemon ad suze). It is still new to skyscraper scene; it is as beautiful inside as the view from the rooftop bars. The famous room, the main bar sits inside a glass box atop the hotel with the beautiful view of the Thames form the Southbank. Have a lovely cocktail whilst you’re exploring this side of the river. It is with a pool. Luna Bar has 360 degree view of the city as well its own signature cocktail. The Luna made of Cointreau, rum and curacao. It is located on level 34 surrounding by towering skyscrapers. A relaxing environment which makes Luna an amazing winning chill out bar. The rooftop bars and restaurant at the STANDARD DOWN TOWN LOS ANGELES is everything you would except a roof top bar In L.A. to be with resident DJs, waterbed pods and a pool overlooking the glittering city light, head to the Biergarten downstairs for traditional German bratwurst and beers. It’s favourite is ski bunnies in winter and adventurers in summer with an epic vista of Lake Wakatipu.the chimneys keeps you warm during the winter month and excellent selection of local beers will cool you down during this summer. It is on the 61st floors above. It provides a unique experience where you are welcomed by a fresh light breeze on a hot night and nice icy cool freshly made cocktail by the roof top open air grill and bar. SIROCCO AND SKY BAR ROOPTOP BARs AND RESTAURANTS. They are in competition with vertigo and Moon Bar. They are situated on the 63 floor with a river view. CABBAGES AND CONDOMS has attracted international attention as it is unique decorated with condom from all over the world plus messages and photos that support family planning. It is located in one of the Bangkok’s main business district. You can choose to sit in an open area under the colourfully lit canopy on the deck or in one of our many air conditioned rooms. So these are some of the favourite rooftop bars but don’t take our word for it go see for you and see the difference.